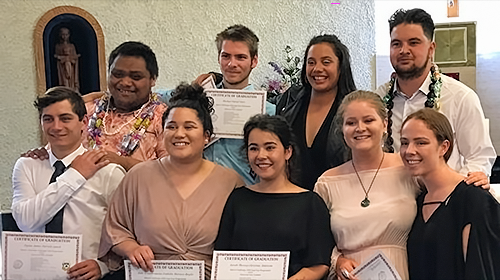 On Saturday the 26th of November 2016, the Marist – Challenge 2000 gap year students graduated from their course, and with a certificate in youth work. The nine students and their friends and whanau gathered in the chapel of St Pat’s College Wellington, to celebrate with a liturgy and presentation. Heartfelt and emotional eloquent and insightful speeches by the graduating students followed. Graduands spoke of their significant experiences, on placement and retreat, and the inner journey by which they have come to believe more deeply, not only in God, but also in themselves and the world around them. Director of Challenge 2000, Steve O’Connor, responded with a vote of confidence and thanks, reflecting on Challenge’s goal to help love and support young people into their best selves, and the fact that these gap graduates were testimony to the significance and success of this work. Fr Tim Duckworth spoke on behalf of the Society of Mary, accepting the thanks of the students, and noted the completion of another challenging yet successful and happy formation programme. The Marist / Challenge 2000 Gap Year is a one year holistic formation programme involving NZQA youth work training, work placements, experiences, and local and possibly international travel. Based at Pa Maria spirituality centre, the programme is managed by Challenge 2000 founder, Kitty McKinley. The Marist / Challenge 2000 Gap Year offers the chance to develop the social, spiritual, intellectual, employment, well-being and physical elements that are required for a positive, successful and balanced life. Participants can also access the extras that will help on their life journey: driver’s licence, first aid certificate and technology training. Already 63 young people from New Zealand and overseas have graduated from the programme. The “real heroes” of the judicial system are the likes of Kitty McKinley says newly appointed District Court judge, Noel Sainsbury. Judge Sainsbury said Kitty McKinley is one of those people who take significant steps to help people from having to return to the system. He thanked her for being at the ceremony and also took the opportunity to single out the Challenge 2000 and WellStop agencies for the work they do in this regard. Judge Sainsbury made the comments in the course of his appointment address to the bench, the Attorney General; Hon Christopher Finlayson, colleagues, family, friends and the public gallery. Kitty McKinley is founder of Challenge 2000 and leader of the Marist – Challenge Gap Year. In a statement on its website Challenge 2000 congratulated the judge on his appointment however regretted the loss of a generous and competent advocate who often represented young people free-of-charge. “We acknowledge the significant asset that Judge Sainsbury will be to the bench, to the parties whose matters he will be adjudicating, and to the wider community as a committed and compassionate arbiter of justice,” the statement says. Calling Judge Sainsbury’s appointment “welcome news”, Challenge 2000 says it reflects the judge’s passion for people and social justice. Judge Sainsbury said he saw his appointment to the bench in Manukau as a further expression of his career in law as a vocation. 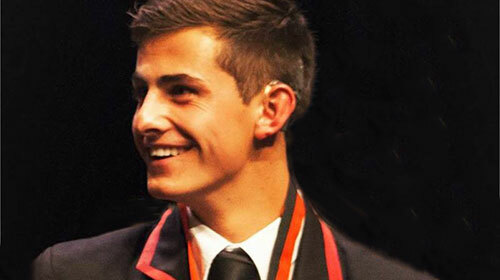 Former St Bede’s College head prefect, Lachlan Bartlett, September 10, received the prestigious runner-up prize in the 2016 Cochlear Graeme Clark Scholarship for Australia and New Zealand. The Graeme Clark Scholarship is an award established to help recipients of Cochlear hearing solutions further themselves by undertaking university studies. Positive throughout Bartlett’s schooling, among his achievements were captaining the First XI football team, winning a University of Canterbury Leaders Scholarship, and winning academic Gold Pockets in 2013 and 2014 and a honours Pocket for Athletics in 2014. 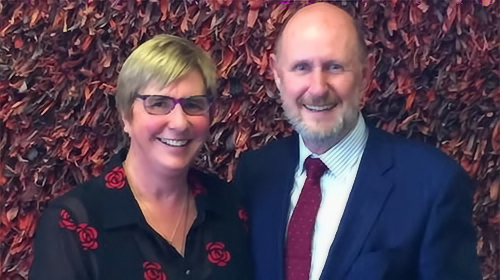 Having recently joined the Marist Leaders Network, a nationwide organisation that helps the Head Students and Prefects of Catholics schools in New Zealand, Bartlett is developing the skills that will one day come in handy in his chosen vocation as a lawyer. “As a leader in many communities, it is crucial that I give back to those around me,” he says. Bartlett credits much of his academic, social and sporting success to the Cochlear implant he received when he was eight years old. He is studying for a double degree of law and criminal justice at the University of Canterbury. Fr John Hannan (left), Fr Alejandro Muñoz (right) of Marist General Administration join LOGOS members Sam Mano (left blue T-shirt) and Jen Martinez (right blue T-shirt). Among other visitors are NZ Marist priests, Kevin Conroy and Peter McAfee (kneeling front). “A profound day” is how LOGOS leader Jen Martinez describes her experience visiting the grave of Marist founder, Jean Claude Colin at La Neyliere, south of Lyons, France. “I was moved to see how many young people were touched and inspired by being with JC Colin. “I am so grateful to have shared singing Mo Maria with the fellow Kiwis as we stood around Fr Colin”, she wrote, giving thanks for her Marist journey on Facebook. Jen Martinez along with Sam Mano and Matt Grevatt represented the Marist Youth Development organisation, LOGOS, at the anniversary Mass of an aspiring group of Marists signing a pledge to found the Society of Mary. The aspiring Marists signed the pledge 200 years ago in the chapel attached to the Lyon Basilica of Our Lady of Fourviere. Dare to Dream programme participants in the auditorium at the Marist Brothers Hermitage. The bi-centennial Mass, was celebrated on 23 July 2016 in the Basilica of Notre-Dame de Fourviere. Fr John Hannan, the Marist Fathers Superior General presided. Prior to the bi-centennial Mass, young Marists from the Marist Fathers, Marist Sisters, Marist Brothers and SMSM sisters participated in a week of activities marking the Fourviere Pledge. Called the Dare to Dream, the programme attracted around 400 young Marists from around the world. With just on a month to go, everything is ready for the launch of Dare to Dream programme in Lyon, France. “The final touches are all that’s left” says Marist Father on the organising committee, Alejandro Muñoz. 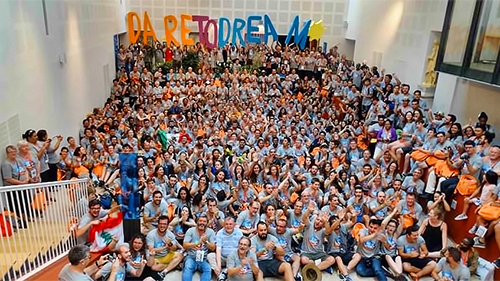 Dare to Dream is a world-wide gathering of Marist Youth taking place from 17 – 23 July and marks the 200th anniversary of the young Marists who signed a pledge at Fourvière to found the Society of Mary. “Sharing “The Marist Places“; our spiritual origins, is such a pivotal part to understanding our Marist spirituality”, he said in a statement and responding to questions put to him. As well as visiting a number of the Marist Places, the programme also provides for participant input. Fr Muñoz thinks the opportunity to meet and learn from other young lay Marists will be a rich experience for everyone. He hopes the youth who mark the Fourviere event will return to their provinces enriched, energised and willing to share the Marist charism. Fr Muñoz also hopes Marist provinces and mission districts will help the Dare to Dream experience grow. “We have a number of New Media networks in place and we’ll of course be promoting these. “I also intend to start a reflection group around the topics of youth ministry and vocations in preparation for the 2017 General chapter”, he said. Of the 400 young Marists participating in Dare to Dream; 50 will represent the Society of Mary Fr Muñoz said. He says the Society of Mary is making a large contribution and the organising committee is very grateful to the Marist school, Sainte-Marie, Lyon who will host the event. The school is going beyond the call of duty and giving extra support and personnel to help make the event go smoothly, he said. 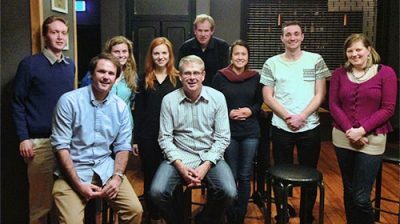 Dare to Dream is the first time since the last World Youth Day the four branches of the Marist Family; Fathers, Brothers, Sisters and SMSM sisters have worked together on a programme for youth. Visit Dare to Dream on the Web and follow Dare to Dream on Twitter and Facebook.